This website contains all the essential Madrid tourist guide information that you need to plan a visit to the city. Whether you are travelling to Madrid with friends and family, your partner, or simply visiting the city on your own, there will be essential information on this website to help you get the most from your time here. This Madrid tourist guide has been written and created by people living and based in the city to ensure you not only get the most accurate and up to date information but also an invaluable insight into what life is like here in Madrid. Look out for the tips sign throughout the site. Here you will find little-known facts, tips and hints that are hard to find anywhere else. The tips sections of the site will save you both time and money on your visit to Madrid and give you insider information about the city. 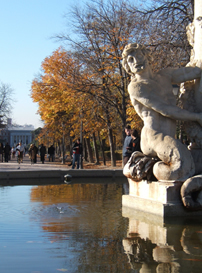 It's really easy to plan your visit with this Madrid tourist guide website. If you know what kind of information you are looking for, then simply click on one of the content headings to the left of this page. If you are still in the early stages of planning your trip, and you're not yet sure of which parts of the Madrid city you would like to see you can search our site to see everything here first. Just use our Tourist Guide search box at the top of each page and type in a few keywords associated with the information you're looking for, and you'll find links to information pages that will answer your question. Each article also comes with photos to give you the best view of each attraction, hotel or location and at the foot of each pages you'll find " Related Pages" to the one you are reading. In A Nutshell, What Does Madrid Have To Offer You? Madrid possesses a wealth of cultural attractions. The Madrid tourist guide takes you around the museums, art galleries and palaces, step by step, providing you with useful factual information about opening times and entry fees, in addition to illustrative photographs. Madrid is a thrilling city with hundreds of theatre shows, opera, dancing and countless other forms of nightlife. You will also find the most exciting places to go for a night to remember. The children will adore Madrid. There are enough theme parks, zoos and excursions to keep them occupied for weeks. This Madrid tourist guide will help you decide before you get here, where to take the children for the most fun. Madrid is not without its romantic side. As the new home of Flamenco, Madrid is alive with music and passion. The many stunning parks and gardens provide tranquil spots to stroll and the numerous quaint little tapas bars offer a warming ambiance all year round. So to begin your holiday planning click on one of the links on the main navigation bar on the left hand side or try typing in a few keywords into the Tourist Information Search Box found at the top of each page.